As I've mentioned before, we are in the middle of HUGE rehab of our kitchen. We had always planned on renovating it when we moved in, but we are now under pressure to do it quick since we have to put our house on the market soon. The other thing that has changed was our game plan. Originally we were going to remove the wall between our laundry room and kitchen and expand the kitchen to include an eat-in area. 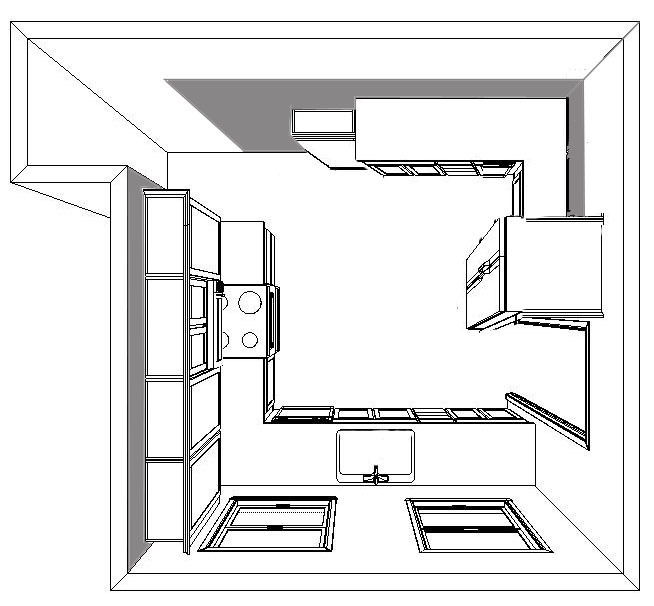 We also were going to move the washer and dryer to the top floor of the house so I wouldn't have to lug laundry up and down the stairs and rearrage the layout of the stove, sink and fridge. Our original budget was about $30,000. Well, with today's housing market we knew we wouldn't get our money back with that plan so we cut back and instead decided to pretty much leave the kitchen layout as is and just upgrade the horrible 1982 cabinets, remove the half-assed wood paneling and replace the peel and stick fake wood floor. New budget: $10,000. If you have done any rehab before, you know that $10,000 actually isn't very much money to do an entire kitchen from scratch, so I am going to have to do a lot of the work myself. We also know that were ripping into some of the original structure from 1905 so it wasn't going to be easy. I guarantee we run into some complications. But it HAS to be done. The kitchen is downright awful! They gray on the walls is old wood paneling/wainscoting. The small square in the top center is the radiator. The dishwasher is next to the sink, the little notch on the upper left is the doorway to the dining room, and the door on the lower right leads to the laundry room. 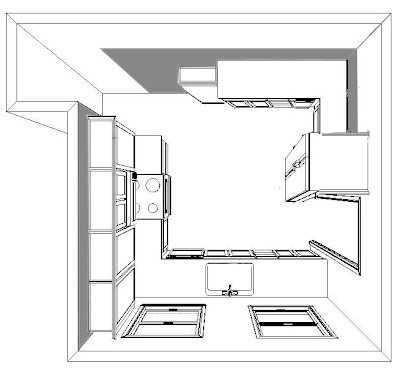 The stove and door leading to dining room (looking at the upper left of the floor plan.) I have put up a temporary shelf next to the radiator that I am using as a make shift pantry, but you can see that blocks the traffic flow. 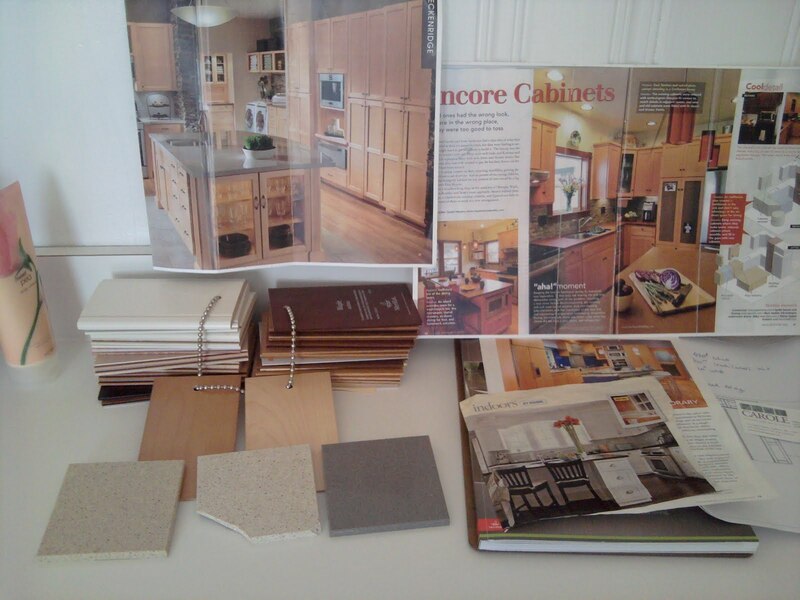 You also can see the awesome white and oak cabinetry we have. Reminds me of my college rental apartment. Gross. This is the door to the laundry room (looking at the lower right of the floorplan.) The sink is strangely centered between the windows so you can't actually look out while you are washing dishes. Unfortunately because of the cost of moving the drain (and the fact that the washer is actually hooked into the sink drain line) we aren't going to move it. You can also see that we have a countertop microwave. We are going to replace the range hood with a microwave combo to free up some counter space. I HATE the way the fridge floats out in the middle of the room and when you walk in you are assualted with a view of the side of the huge fridge. I also hate that there are so few upper cabinets in this kitchen. That drives me crazy. Lots and lots of lower cabinets are good for pots and pans, but I don't like storing food near the floor. I am going to increase the number of upper/wall cabinets by adding a pantry and I'm going to move the fridge away from the doorway. Everything else is pretty much going to stay the same. The big challenge will be the paneling. It doesn't look so awful in these pictures, but in real life is is pretty nasty. It has clearly had one to many coats of paint, it is all banged up, it sticks out about an inch from the wall, and for some reason doesn't cover all the walls. Just the three in that floor plan. Plus the style of the new kitchen is going to be much less traditional and so it has to go.